All was well and good until Mattawa. I had just met up with my longtime friend, Nathan, the day before — after months of badgering, he had agreed to join me for three days en route to Ottawa. This was to be our first day on the road: North Bay to Stonecliffe. As we climbed the hill out of Mattawa, already drenched in sweat from the morning’s ride, his rear spoke snapped. One problem: Mattawa has no bike repair shops, and the nearest place to get it fixed, North Bay, was 62 kilometres behind us. The day was not going to unfold as planned. We limped back into town and started running through our options. He suggested I press ahead, not wanting to disrupt the ride. I declined — we had just started riding together that morning, and whatever the day led to, we’d get through it together. The rest could wait. I had a spare spoke, so we set about trying to replace the spoke ourselves — never mind if mine was a touch smaller than the ones on his wheel. Soon enough, a crowd formed. A husband and wife arrived with tools and set to working on the wheel. Another man joined in. A passerby offered money for a motel room that night — it was getting late in the day, and our odds of getting out of town were slim. It was also becoming increasingly clear we weren’t going to fix the bike in Mattawa, no matter the tools we had. Just when it was looking like we’d accomplished all we could, a man walked up and asked where we were headed. I told him our hope was Pembroke — the nearest place with a bike shop without backtracking to North Bay. As it happened, he and his wife were heading east for a cycling trip of their own and had a bike rack on their truck with extra space. You know the hitchhiker’s dream for a bicycle tourist? This was it. Just like that, we went from stuck in Mattawa to sitting pretty in Pembroke — and back on the road the following day with a new rear spoke. 1. You have to marvel at the kindness of people in this country. 2. Things may not always happen as planned, but they often happen as they should. 3. You might be thinking, “but wait! You didn’t bike to Pembroke!” Well, sometimes, cheaters do prosper. 2. Ontario is beautiful, but you have to laugh at some of the names people come up with for towns, lakes, and rivers. To wit: between White River and Wawa, you pass both Fungus Lake and Desolation Lake. Could you pick two less appealing names for a place to swim and fish? 3. On the road, a little company goes a long way. Thankfully, my ride over the last week and a half has led me to new friends. I met Ken, a cheery graphic designer from Seattle, leaving Marathon. 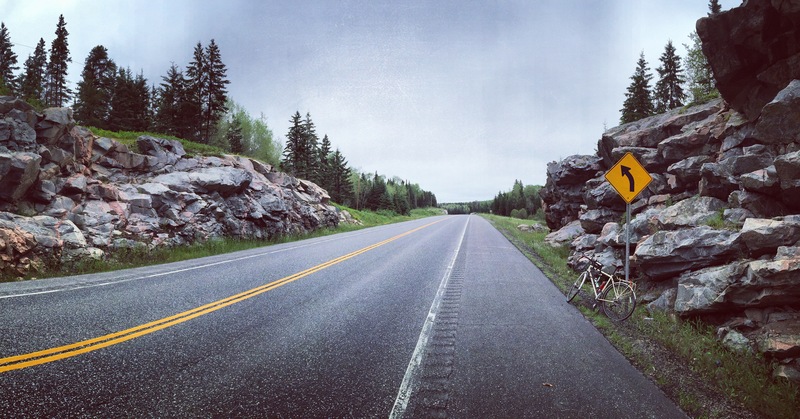 He’s exploring Canada at length for the first time by pedalling across the country. Brent and Claire came up and introduced themselves in Wawa. 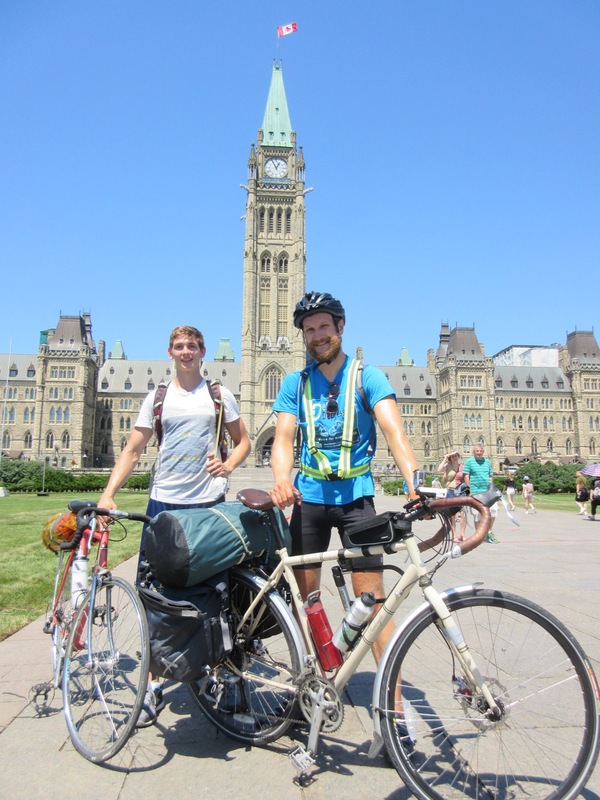 A sociable couple from New Zealand, they’re cris-crossing Canada on a tandem bicycle. When they’re done, they’re going to hike across their home country. For awhile, the four of us crossed paths just about every day — always a guarantee to put a smile on my face. This was in a farmer’s side yard, just outside of Beachburg. Somewhere in here, there’s a joke to be made about when nature calls. 2. Familiar haunts, part 1. North Bay has become somewhat of a summer pilgrimage for me of late — this marked my third visit in the past three years. We’ll see what next year brings. 3. Familiar haunts, part 2. Most unusual sleeping location: Curling rink. 17 days on Highway 17. Two and a half weeks of rolling hills, rugged rock faces, towering trees, picture-perfect lakes, and a whole lot of highway. A confession: when I started the bike trip, I dreaded Ontario — it was too long, too traffic-heavy, too bug-infested, and too familiar for my taste. I’ve spent 23 years in Ontario — I wanted to see other provinces. To my delight, Ontario has offered some of the most breathtaking rides and best memories of the entire trip. It has also challenged me more than any other province — leading to days of doubt, dejection, and utter exhaustion. With each hill to climb, though, comes a summit — and after all the blood, sweat, and tears, I’m still here. 1. The stretch of Highway 17 in Ontario from the Manitoba border to the Quebec border is just shy of 2,000 kilometres. By comparison, in that distance, you could go from Paris to Rome (1,413 km), Berlin to Moscow (1,815 km), and New York City to Tampa Bay (1,819 km). Yet another reminder of just how massive Canada is. 3. Thunder Bay has a pastry called a Persian — picture a cinnamon bun smothered in pink icing. I nearly went mad trying to get my hands on one. My dad and I went to five different places before I could finally try it for myself — the first two were closed; the following two were sold out. I was a man possessed. 4. Kids say the darnedest things. My dad told a ten-year-old in Ignace that I had biked all the way from Vancouver and was heading across the country. His advice? “Don’t die like Terry Fox.” Thanks, kid. 5. On the topic of Terry Fox, it was a special moment to stop by the monument in his honour, just outside of Thunder Bay. He has been a great inspiration to me, and throughout this ride, his efforts have taken on greater significance — not only as I find myself battling with the elements, day in and day out, but also as I mourn the loss of a cousin to cancer. Inuksuks are everywhere along the Canadian Shield — standing guard over this vast, beautiful, and rugged landscape. Before leaving for the trip, my neighbour described Northern Ontario to me by saying, “you can see where the Group of Seven got their inspiration from.” He’s right. The surroundings are so spectacular, it would be a rarer feat not to be inspired. There are two major ones along Highway 17: Kakabeka Falls (near Thunder Bay) and Aguasabon Falls (near Terrace Bay). Both were worthy side-ventures from the road. Mosquito, black fly, and horse fly bites: Innumerable. There’s something deeply peaceful about cycling down a rural Manitoba highway on a cloudy morning without a soul in sight. It’s the kind of ride that awakens the poet inside: the clouds are your canopy; the trees are your company; the birds are your chorus — all in perfect harmony. That’s how I started my ride out of The Narrows, before I made a decision that would both haunt and help me more than I could imagine. As I approached the 20 km mark en route to Arborg, I spied a sign for Winnipeg that read 160 km — not an unreasonable distance, after my previous venture of cycling from Yorkton to Dauphin. With the winds blowing south, I decided to change course and head for Winnipeg a day early. It took another 35 km of pure grit — and all of my remaining food supplies — before I arrived, legs protesting, at my destination. Final tally for the day: 215 km. Never again. 1. The universe is always listening. I was mentioning to my girlfriend how lonely it can be camping solo, and mere minutes later, a fellow camper walked over and struck up a conversation, curious about my bike. He invited me back to his family’s trailer for a campfire, and he and his wife shared stories and snacks long into the evening. 2. I’m thrilled to share that donations for mental health support have surpassed the $10,000 mark! I set out on the ride nervous about how and when that fundraising mark would be reached, but again and again, I’ve been overwhelmed by the support of others. To spend time in Winnipeg is to be immersed in history, both musical and national. This is the land of Louis Riel, Niel Young, and The Guess Who, and the hallmarks are everywhere — from the Burton Cummings Theatre to Riel’s gravesite. The benefit of my early arrival was that I was able to enjoy an extra day of rest and sightseeing in the city and nearby. Patricia Beach offered the perfect venue to spend Canada Day afternoon, and the following day held its own share of beauty, from a stroll around The Forks (pictured) to the St. Boniface Cathedral. Mosquito bites endured: Surprisingly few.